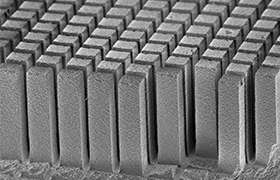 Smart Material manufactures 1-3 composites using the standard Dice & Fill method, which is the current industry standard for frequencies above 1MHz. 1-3 Dice & Fill piezo composites are prepared by dicing a piezoceramic plate into an orthogonal array and cutting 80%-90% of the plate thickness. 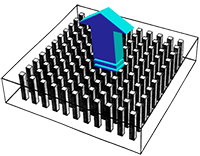 The pitch (distance between rods) must be very small, typically near 100µm at 5 MHz resonance frequency to avoid lateral modes and grating lobes. The kerfs or trenches are filled with epoxy or other polymer material. After the interstitial material has cured the uncut side of the ceramic is grinded down to the rod structure and the thickness is adjusted to the desired resonance frequency. This yields a regular pixel or rod distribution required for phased array ultrasound transducers. Smart Material is typically manufacturing Dice & Fill standard composites for frequencies between 500kHz and 15MHz with maximum sizes of 75mm by 75mm. Available fill factors range from 25% up to 65% and available PZT materials are Navy Type I, Type II (standard), Type III and Type VI (standard). Single crystal materials, i.e. PMN-PT are also available on request. Smart Material offers various standard epoxy and polyurethane systems as the interstitial material, often called filler. The available filler materials allow for operational temperatures between 95°C and 130°C. Smart Material's machining equipment and capacities also allow the manufacturing of curved 1-3 Dice & Fill piezo composites as well as complex array structures and interconnects.